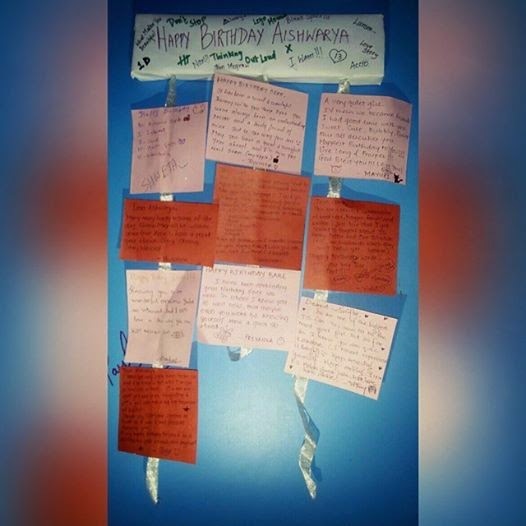 Mindscape in Words: Turning 21! Isn't it the best feeling, being loved? My 21st birthday was filled with lots of it. Love from my family, love from my friends, love from all my close ones. It felt divine. I was the happiest person on March, the 19th! Also, all of those who kept a status and changed their display pictures for me, I cannot love you enough. I feel destined to have such amazing people around me who care for me and wish for my happiness. I love you all. So, here's a post for all of you who made my day ultimate! It was startling that so many people wished me at midnight. Giving up sleep is no easy task. So my day started at 8 am. I woke up happy with mom and dad wishing me. Then I studied for over an hour. I know, who studies on their birthday!? Apparently I do, but it didn't last long. 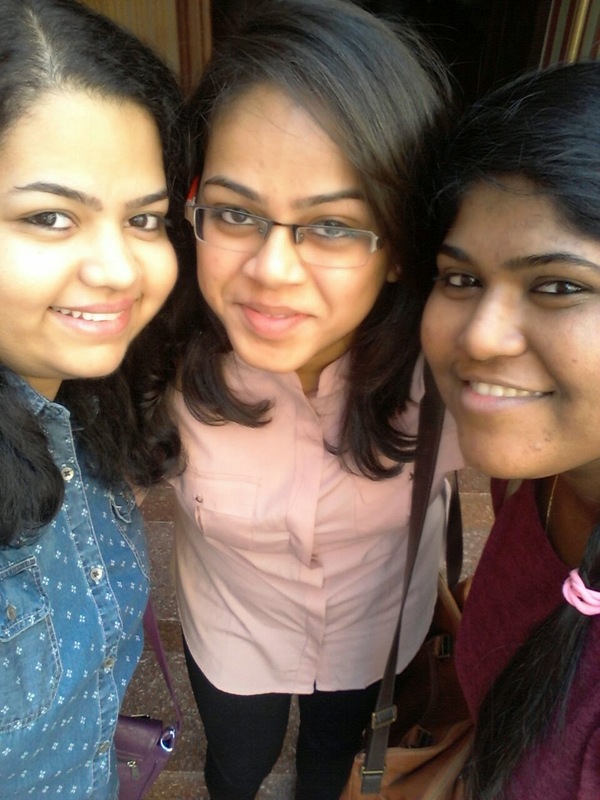 Then, I met two of my best friends; Priyanka and Suruchi for lunch. We had a pleasant time with good food and some laughs. They gave me a huge greeting card. I was speechless and filled with emotions. 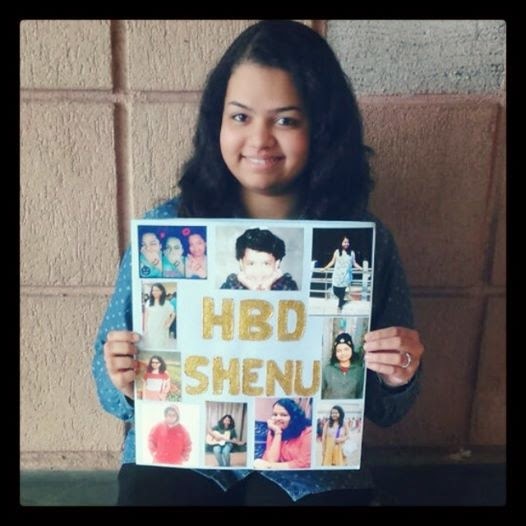 It had all my photos on the front and "HBD SHENU" was written in the center with golden glitter. Inside, both of them had written some wondrous lines about me and our friendship. It touched me deeply. The efforts they took for this were clear in the face of it. I couldn't stop smiling about this wonderful gesture! 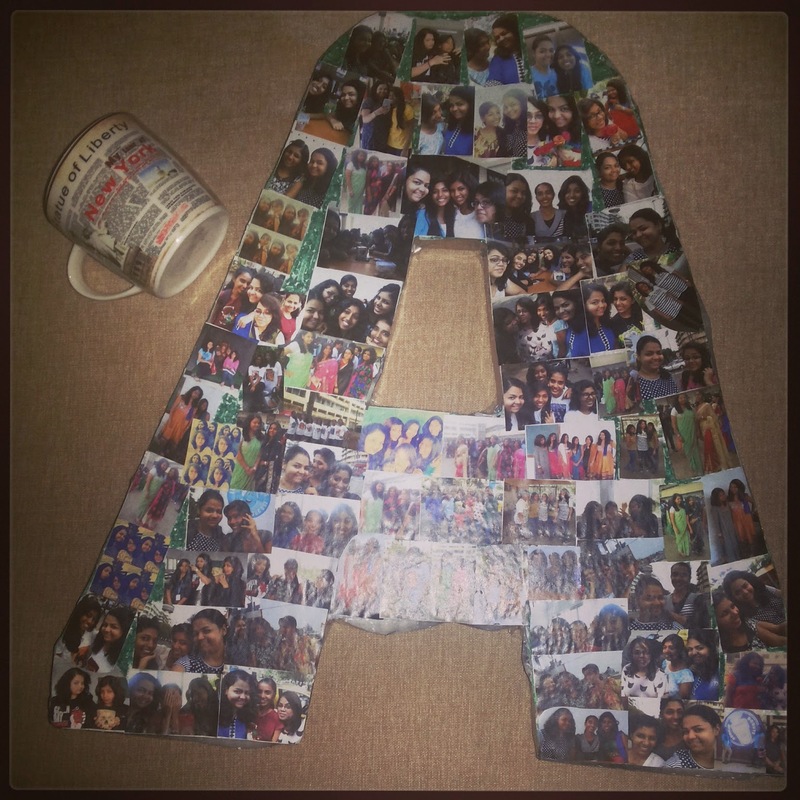 The "A" collage with the mug. Post lunch I was planning to take them for dessert but they suggested to go at my home. I didn't exactly get the point of it but I played along. I am never hopeful for anything extraordinary and that's why it took me by a great surprise when I saw my collegemates! There they were; Ruchita, Vidhi and Nilambari, looking at my absolutely astonished face! Excitement took the best of me and left me overwhelmed and yet again speechless. I hugged them and revived soon. And then there was a line of spectacular gifts which sent me back to my surprised and speechless zone again! Vidhi, Nilambari and Ruchita took out this huge outline of an "A". It was a collage made out of numerous pictures! 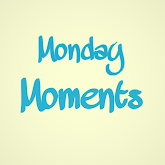 Name any incident and the memory of it I could see there. There were photos of our BSE visit, Ruchita's birthday, Bandra shopping, mall hangouts and of course, the college days. They also included photos from the teachers' felicitation program which was just a couple of weeks earlier. Just everything! If I could cry, I sure would have had tears of happiness. It didn't end there. They took out this marvelous paper wall-hanging wherein many of my friends had written something about me. It had ten pieces written by ten friends. It was just so cool that I couldn't believe they would make something so artsy for me. 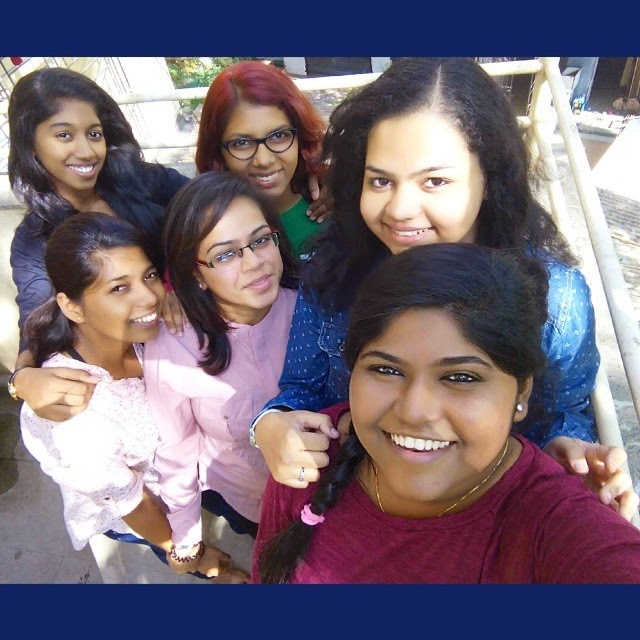 It was written by Shweta, Husaina, Nilambari, Pooja, Ruchita, Vaishnavi, Priyanka, Mayuri, Vidhi and Winny. I adored it a great deal. It's unbelievable how a few words from friends can make you so insanely happy! I immediately hanged it up on my study-table and it looked like it just belonged there. Every time I will open my room, it will be the first thing that I will see and it will put a smile on my face in nanoseconds. Thank you so much, girls! 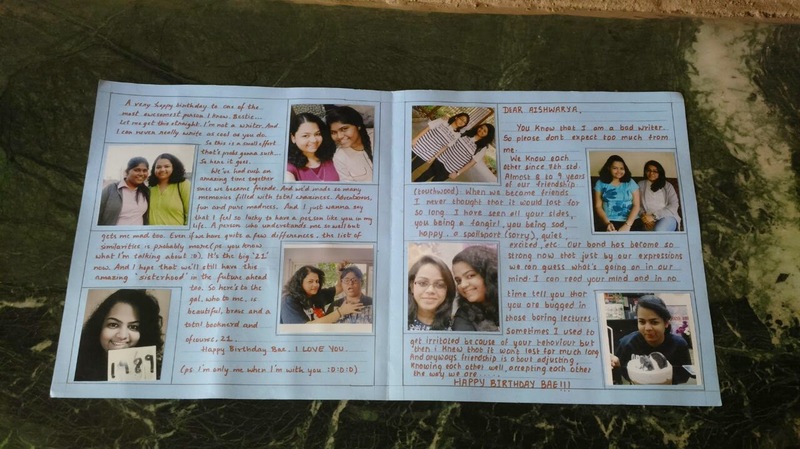 The last gift was a lovely coffee mug which was from Vaishnavi, Nilambari, Ruchita and Vidhi. It had New York written on it along with the Statue of Liberty. It was great. 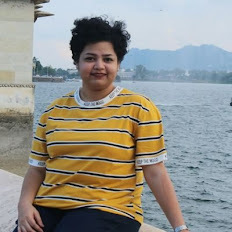 My friend, Nilu also wrote a sweet & funny little poem which I loved. Later, we had a photo session which was a must and then we headed to Amul Ice cream. We shared some laughs there and also India won the quaterfinals! After the ice cream treat, Nilambari, Vidhi and Ruchita left. I really missed Vaishnavi and her jokes. I hugged them again and we departed. Suruchi and Priyanka stayed with me until my school-time best friend; Divya arrived. 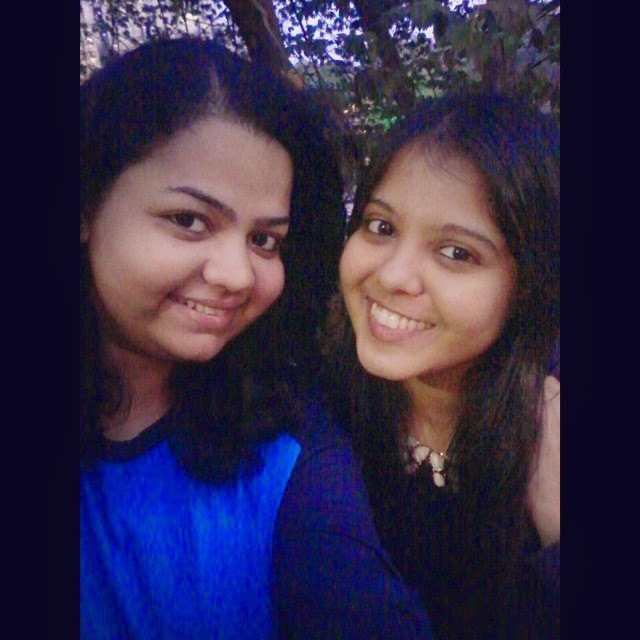 Divya and I were meeting after quite a long time. So, we talked non-stop. It's funny how we can catch up on everything within just a matter of minutes. Whole days then, narrated in a few minutes now. She gave me a cupcake which was delicious. We walked around a nearby lake for some time. I told her about the concert, my exams, my new books and so on. 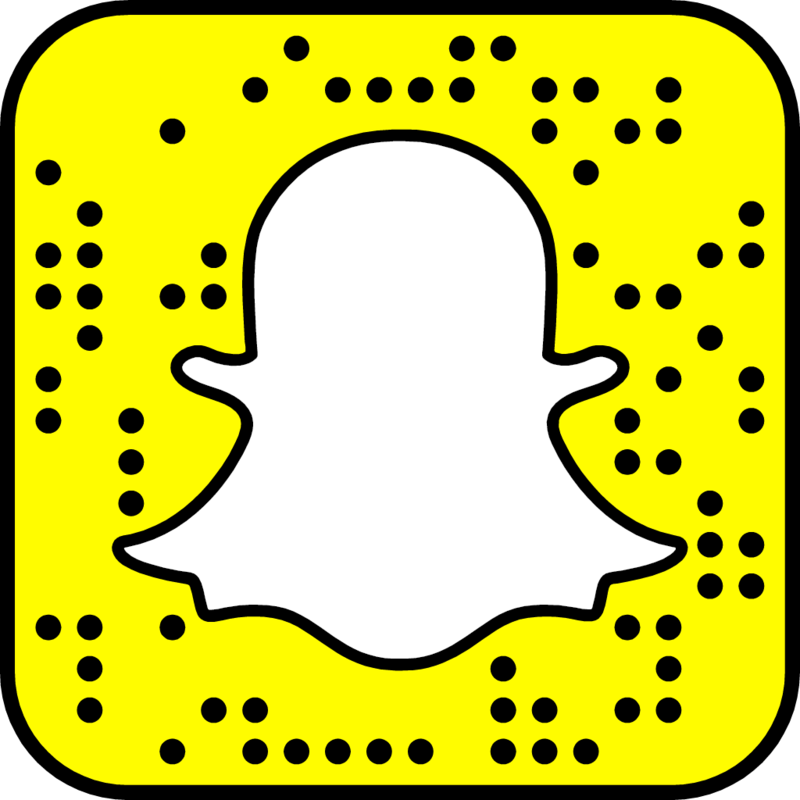 She talked about her moot in Lucknow, her night out and other funny stories. It's always a delight talking with her. Finally we bid goodbye. Now was the precious family time. There wasn't cake cutting because we are not huge fans of cakes or pastries or whatever. Mom put a tilak on my forehead and then I seeked everyone's blessings. Then it was dinner time. Mom had made the most delicious 'Paneer Bhurji', Dad got 'Ras Malai' and my brother gave me a chocolate (which I'm sure mom would have asked him to get.) We all had ice cream later. It was such a merry time. My day went by faster than I had thought. It was filled with more people than I had imagined and I loved it. It was filled with happiness and love. I felt so close to everyone, like they really know and understand me. It was an out-of-the-world feeling altogether. I love them. They are my persons. Thanks Divya. It'd have been amazing if we could meet everyday!